It’s no secret that I have a love for the Modern Rustic trend. No overly styled, everything from one shop, keeping up with the latest fashion trend (pineapples!?) for me – no! I prefer interiors that have a soul. Let me explain. Modern Rustic is a pared-back look where natural woods mix with textured linens, chalky handmade ceramics and tarnished metals. It is a look that pairs old with new, rough with smooth and natural and the man made. It’s the combination of utility and beauty. Function and form. Soulful interiors which have developed over time. As the Japanese love to call it ‘Wabi sabi’ – the love of the imperfect, the raw, the natural. So imagine my delight when Denby Pottery asked me to help launch their latest product range ‘Studio Craft’. With it’s inspiration set firmly within the Modern Rustic trend, it was love at first sight. 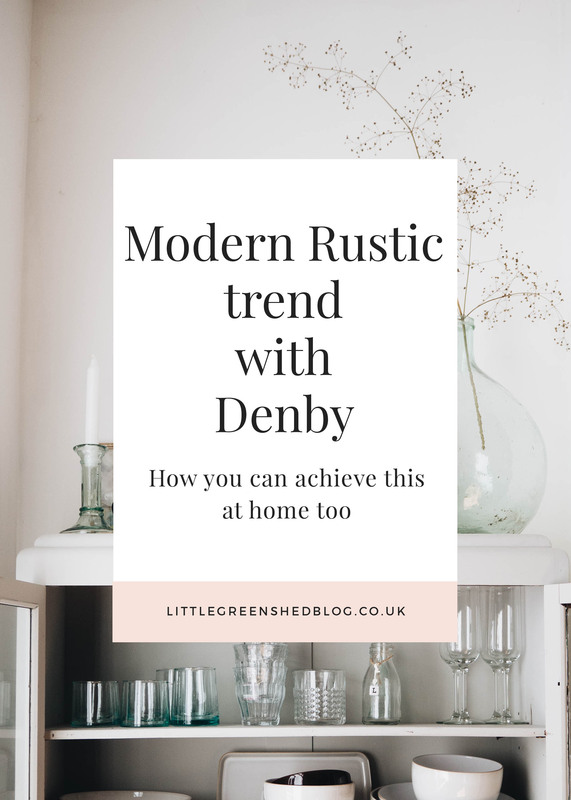 Over on the Denby blog, I have shared my tips on styling a shelf using the Studio Craft and Natural Canvas ranges in the modern rustic style. You can read it here. Studio Craft has a ‘hand thrown, hand made’ feel about it. With stunning textural glazes with a speckled effect, this range is inspired by the trend for an honest and rustic aesthetic. This artisan collection combines smooth and ridged textured pieces and features woody colourways in Elm, Birch, Walnut and Chestnut, creating a natural aesthetic when stacked or mixed with existing pieces. 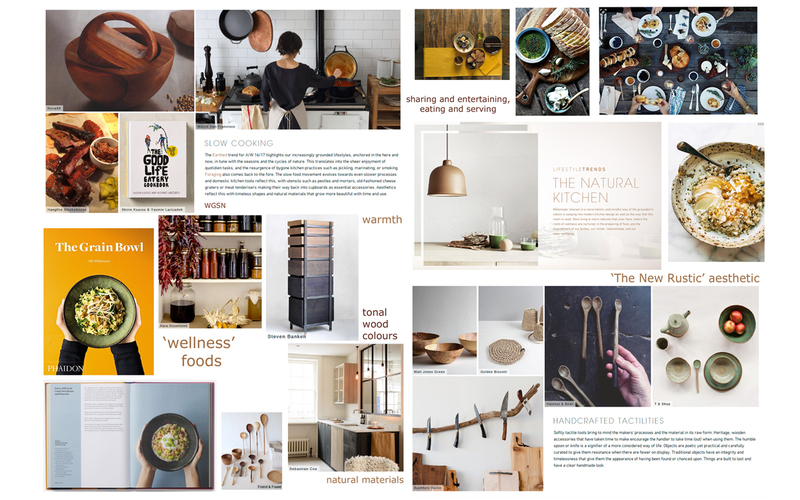 I love the mood board for this range. Slow cooked food, authentic in style, gathering of friends and artisan made pieces. So very Littlegreenshed, right? So how do I incorporate the Modern Rustic trend into my existing interiors style? 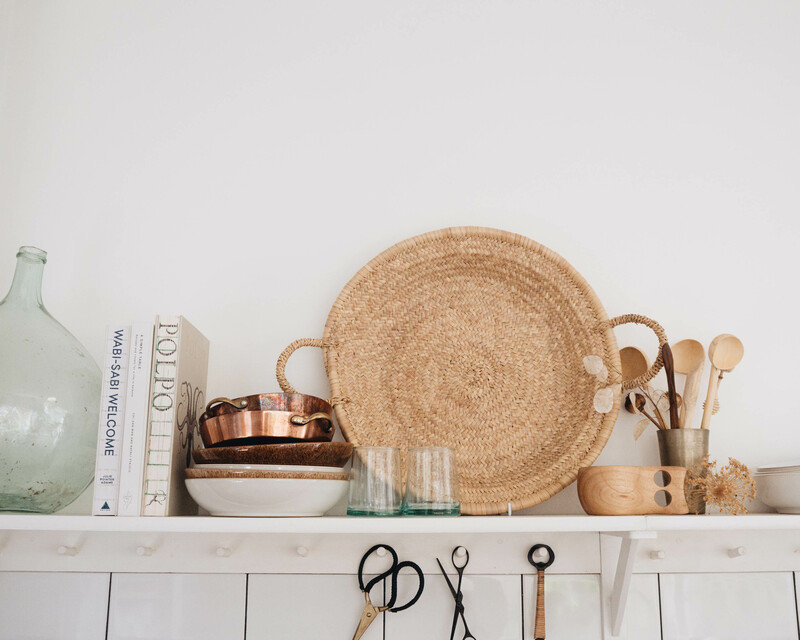 My kitchen has one long open shelf, here I love to display my cookery books, a round bread basket and glasses bought back from a trip to Marrakesh. A large glass bottle from a French brocante. A wooden kuksa mug from Dan’s recently trip to Finland. And there in the mix are the Studio Craft and Natural Canvas bowls, stacked ready to be used. Fill it with items you love, that have a meaning to you. Vintage finds, items from your travels, cookery books with your favourite recipes. If you love them, then you will love seeing them, every day. 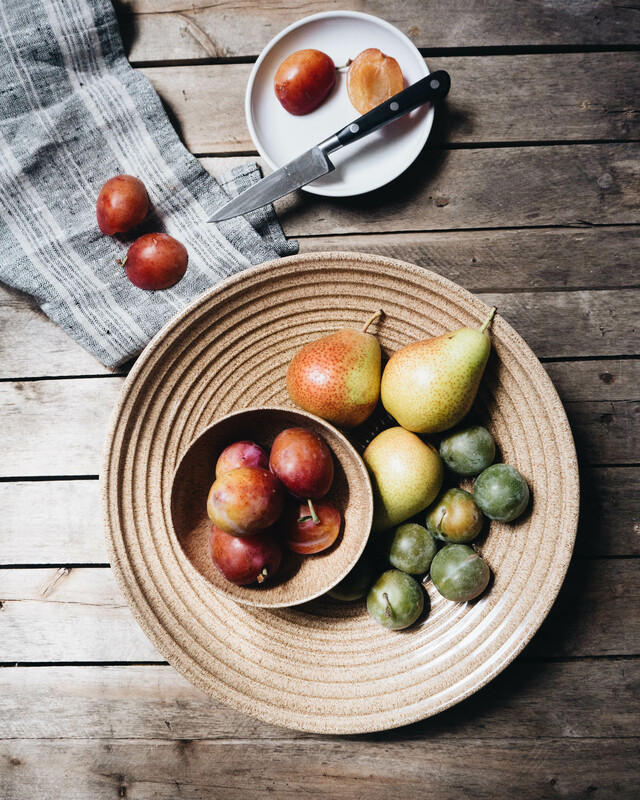 Stack crockery in tonal colours to avoid colour blocking. The key here is mix it all up. If you want to house your dry goods (rice, pasta, lentils) on your shelf, then invest in some good containers. Glass kilner style jars are always practical and pretty. Decant your tea, coffee, olive oil and sugar in interesting bottles and jars. Don’t be afraid to add elements from nature, dried seed heads, a pot of fresh herbs, a plant or two. Invest in artisan made products, wooden spoons, scissors and knives, you won’t regret it. Above all anything goes, but try not to chuck up there the marmite jar or your cans of lager as it will kill your aesthetic. To launch the Studio Craft range, and my involvement, Denby are offering a 10% discount on all Denby products. Use the code LOU10 at the checkout. Pop over to Denby to discover the Studio Craft yourself. Oh and I’m taking over their Instagram account this week too! Head over to @DenbyPottery and say hi! Collaboration Note: This post was written as part of my on going partnership with Denby. All words, thoughts and images are my own. Thank you for supporting the posts that make this blog possible. 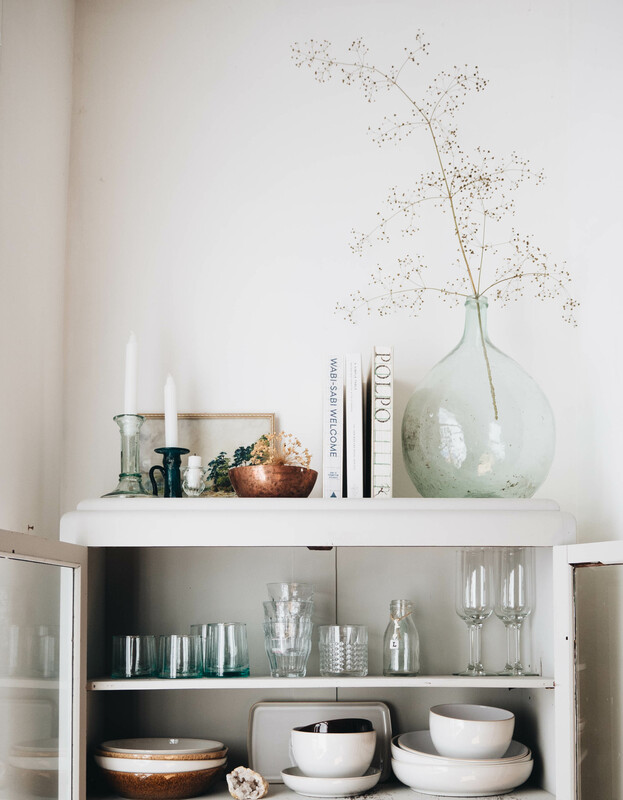 Getting so much inspiration from this post, love natural, raw and imperfect interiors. I adore your white cabinet in the first shot – so timeless. Is it a vintage piece? I love your cabinet too. I just picked up a 1930s wooden cabinet with 2 glass doors and 1 wood door from Freecycle. It cost me £30 to hire a “man & van” to bring it home. I want to paint it and really like how yours looks – did you use normal latex paint or chalk paint?